– Where can I find some good Hong Kong shopping malls? – What kinds of stores are inside, and what do they sell? – How do I get to any of these shopping malls? Depending on what you’re planning to buy, you’ll need to visit a mall containing stores selling what you’re looking for. The problem is, with so many Hong Kong shopping malls in the city, you probably don’t know which ones are worth visiting. You may not even know a mall carrying what you want exists at all. This can make shopping a bit confusing for travellers visiting a big city like Hong Kong. It’s best to know what the Hong Kong shopping malls have, and what to expect before you get there. This is where I can help you out. You don’t want to spend an hour or two travelling to a mall in Hong Kong to find out it has nothing you were hoping it would have. You may be able to save some money if you buy things from a mall containing independent shops. You can compare prices at a couple shops if you have time, but don’t spend all day comparing. It’s not worth obsessing over the price all day if you’re only going to save $10-$20 HKD. Brand name products are usually the same price in every store, unless you find a store having a sale. If you do find a store selling a high priced, brand name product for very cheap, there’s a good chance that product could be fake. You can trust a Brand name store, like Burberry or Chanel, to have authentic products. You can also trust department stores will only sell the real deal. It becomes more difficult to tell if brand name products are real or fake at a store selling 2nd hand items, or stores selling products made by many different brand name companies. Use your own judgement here. If it seems too good to be true, it probably is. Visit my Hong Kong shopping page to learn about all the unique shopping markets in Hong Kong. The following is a list of malls in Hong Kong, separated by region. You’ll find information on what kinds of stores are inside, how to get there, and any other important information that I have. The Hong Kong shopping malls on Hong Kong Island tend to be a little more high class than the rest of the city. They’re fairly big and have many brand name stores inside. If you’re looking to buy brand name clothing, handbags, cosmetics, shoes, or any other types of fashion, I recommend visiting Causeway Bay. You’ll find a lot of Hong Kong shopping malls in Causeway Bay that carry these things. If you want to buy electronics or computer products, visit Wan Chai. The Wan Chai District has several malls that sell computers and electronic gadgets. Some malls in Hong Kong have escalators that go up or down more than 1 floor. So pay attention to which escalator you get on. Otherwise you may end up going past where you want to go, without noticing until it’s too late. Cityplaza is the biggest shopping mall in eastern Hong Kong Island. It’s found in the Tai Koo District and has many well known Hong Kong stores inside. Pacific Place is a well known high end shopping centre found in the Admiralty District of Hong Kong Island. 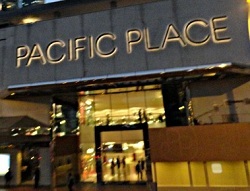 Pacific Place includes a shopping mall, hotels, office buildings, and apartments. The Peak Tower and The Peak Galleria are two shopping centres located at the Victoria Peak. These shopping centres have lots of interesting stores filled with souvenirs, gifts, clothing, and many other interesting items. Times Square Hong Kong is a giant shopping centre found in Causeway Bay. 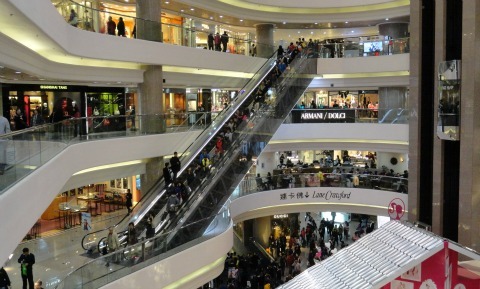 It’s a very popular Hong Kong shopping mall due to the wide variety of different stores found inside. You’ll recognize it right away by the unique Times Square clock built into the building at one of the entrances. WTC more or World Trade Centre is another Hong Kong shopping centre located in the Causeway Bay District of Hong Kong Island. It’s situated at the waterfront of the Victoria Harbour. SOGO is a large, Japanese department store found in the Causeway Bay district of Hong Kong Island. The whole mall spans 19 floors. Each level specializes in specific items that are different from every other floor. There’s also another SOGO located in Tsim Sha Tsui, Kowloon. The ifc mall is a fairly new high end shopping mall found in the Central District. 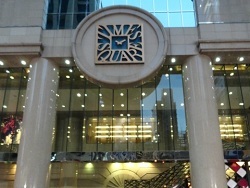 Ifc consists of an office tower, a shopping mall and the Four Seasons Hotel Hong Kong. 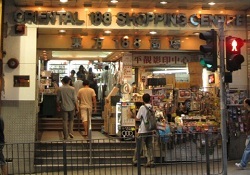 The Oriental 188 Shopping Centre is your one stop shopping centre for video games, peripherals, movies, anime, toys, electronics, accessories, batteries, and much more. If you’re looking for any of these things, there’s a good chance you’ll find it at 188. The 298 Computer Zone is a mall containing computers, laptops, computer parts, accessories, and electronics. There are also a few stores inside that sell video games and peripherals as well. Wan Chai Computer Centre is another mall in Wan Chai selling computers, laptops, computer parts, accessories, electronics, and video games. This mall is usually a bit busier than 298 Computer Zone because it’s located at the Wan Chai MTR Station. Hong Kong shopping malls are everywhere in Kowloon. This part of the city has anything from high class shopping malls to small shopping centres, and anything in between. On top of all the malls in Kowloon, there are marketplaces and street shops you can visit as well. Some of the markets have themes, such as fish and aquariums, flowers, or products made from jade. For more information on the marketplaces in Kowloon, visit my Hong Kong shopping page located here. There are a lot more malls in Kowloon than there are on Hong Kong Island or the New Territories. Shopping is the main attraction in Kowloon. So if that’s what you’re looking for, you’ve come to the right place. Some people claim that prices for items are cheaper in Kowloon. I personally don’t know how true this claim really is. My experience is that it all depends on what you want to buy, and where you buy it from. If you buy your item from a big store with locations all over the city, it’ll be the same price in all of those stores across the city. Something to be aware of while in Kowloon is the sheer number of people surrounding you everywhere you go. Some of the districts in Kowloon are among the most densely populated places in the world! Keep an eye on your belongings at all times because it’s easy to have something stolen in large crowds. The most popular part of Kowloon to visit for shopping is Tsim Sha Tsui. There are so many Hong Kong shopping malls, street shops, hotels, restaurants, and museums in Tsim Sha Tsui, some people can spend their entire trip in Tsim Sha Tsui and never run out of things to do. 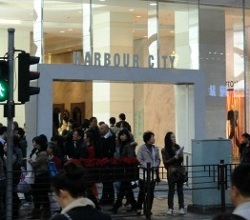 Harbour City is the biggest shopping and entertainment centre in Hong Kong. 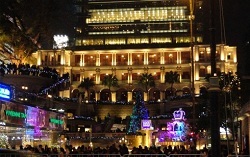 It’s located on the west side oceanfront of the Victoria Harbour in Tsim Sha Tsui, Kowloon. Inside Harbour City you’ll find 2 Cinemas, the Marco Polo Hong Kong hotel, and some of the biggest brand name stores in all of Hong Kong. A large mall found at the Kowloon MTR Station in the western end of Kowloon. The Elements mall is divided into 5 sections or “Elements.” They are Earth, Water, Metal, Fire, and Wood. A large Japanese department store found in Tsim Sha Tsui, Kowloon. Here you’ll find anything from women’s and men’s fashion to stationary and home décor. Each floor in the mall sells different items. 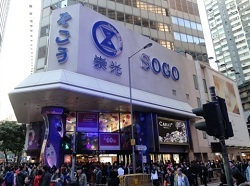 Another SOGO mall can be found in the Causeway Bay district of Hong Kong Island. A new high end shopping mall created out of the old Marine Police Headquarters in Tsim Sha Tsui. Items sold at 1881 Heritage are very expensive. 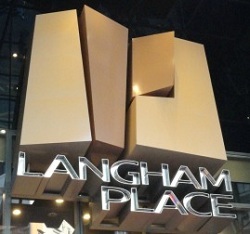 A shopping mall in Mongkok, Kowloon that’s conveniently connected to the Langham Place Hong Kong 5 star hotel. There’s a wide variety of shops inside the mall providing a little something for everyone. You can also find many shopping markets nearby. A shopping centre found in the Hung Hom district of Kowloon. 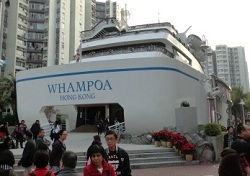 Whampoa mall has the unique shape of a ship and contains shops and restaurants inside. 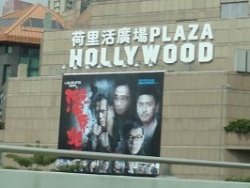 Located in the northeast section of Kowloon, Plaza Hollywood is one of the largest Hong Kong shopping malls in this part of the city. Plaza Hollywood is famous for its Star Atrium where different exhibits are on display throughout the year. Telford Plaza is a big shopping centre located at the Kowloon Bay district of Kowloon. 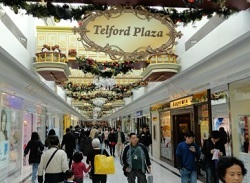 Telford Plaza contains a great selection of shops for visitors through 3 different phase sections. 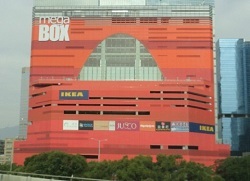 Megabox is a giant shopping complex found in the Kowloon Bay district of Kowloon. The mall is popular for its IKEA, ice skating rink, and shops that target youthful crowds. 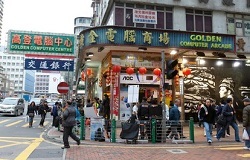 A shopping centre in Sham Shui Po, Kowloon that sells computers, computer parts, accessories, peripherals, video games, and all kinds of electronic devices. Golden Computer Arcade and Centre was the first computer mall in Hong Kong. A shopping mall in Mongkok, Kowloon that specializes in selling computers, electronics, computer parts, video games, accessories and peripherals. 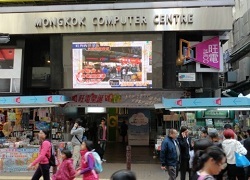 Mongkok Computer Centre is located right next to the Ladies’ Market, making for a great day of shopping. 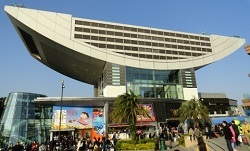 A large shopping mall located in the Kowloon Tong district of Kowloon. Festival walk has stores that range from the expensive high end brand name stores to sports, electronics stores, and everything in between. APM is a shopping mall in Kwun Tong, Kowloon. Its name, APM, implies that customers are welcome at the mall anytime from AM to PM. Many of the stores and restaurants inside the mall are open late or open 24 hours a day. There aren’t too many major malls in the New Territories when compared to Hong Kong Island and Kowloon. Less people live in the New Territories, so it makes sense that less Hong Kong shopping malls and attractions are out in these more rural areas. The two regions of the New Territories that seem to have the most development are Lantau Island and the Sha Tin District. Lantau Island has the Hong Kong International Airport, a few attractions like Hong Kong Disneyland and Po Lin Monastery, and a big shopping mall as well. Sha Tin is famous for its horse racing racecourse, the Ten Thousand Buddhas Monastery, and a couple major shopping centres. New Town Plaza is one of the largest Hong Kong shopping malls in the city. 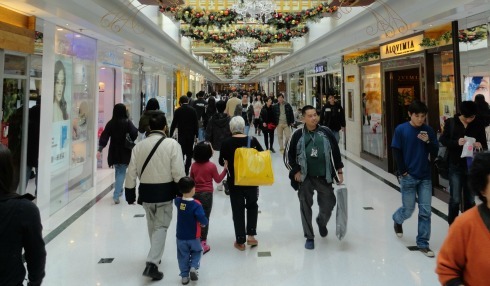 The mall is located in Sha Tin, New Territories and is the closest major shopping mall to Mainland China. New Town Plaza offers a mix of stores that appeal to everyone. Citygate Outlets is the only outlet mall in Hong Kong. This mall is located very close to the Hong Kong International Airport, making it the perfect stop for anyone with a couple hours layover at the Airport. The Hong Kong International Airport is one of the best Airports in the world. If you only have a few hours layover in Hong Kong, you may not even need to leave the Airport to get find good shopping. Tai Po Mega Mall is the biggest mall in Tai Po, New Territories. The Tai Po Mega Mall contains 5 sections which require a bit of walking to go from one to the other. They also have shops that carry items that are more difficult to find. These malls that I’ve listed are the more popular Hong Kong shopping malls in Hong Kong. You’ve probably noticed that quite a few of these Hong Kong shopping malls are located close to one another. Having these Hong Kong shopping malls so close together makes it very convenient to find what you’re looking for. You won’t have to spend your time going all around the city to find what you want. Public transportation stops are conveniently located very close to most of these Hong Kong shopping malls. Some of them even have MTR stations built underneath the mall. Visit my shopping page to learn about all the unique shopping markets in Hong Kong.